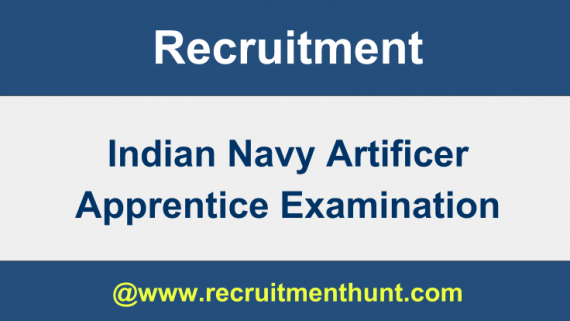 Indian Navy Recruitment: Indian Navy has given employment notification for the Artificer Apprentice (AA) Aug 2019 Batch Recruitment of Artificer Apprentice vacancies under Indian Navy Recruitment drive. Applicants who are eagerly waiting for Indian Navy Jobs can check the latest Indian Navy Artificer Apprentice Recruitment 2019 on our website. So, Indian Navy publishes a notification for Indian Navy Vacancies. So, it is a good chance for applicants who are waiting for Indian Navy AA Recruitment can check details on our page. Also, for sake of applicants, we enclose Indian Navy Artificer Apprentice Notification in below sections. Therefore, applicants can go through Indian Navy AA Notification 2019, Indian Navy AA Syllabus, Indian Navy Recruitment, Indian Navy Artificer Apprentice Hall Ticket, Indian Navy AA Syllabus PDF and apply before the Closing Date. Also, we provide Indian Navy AA 2019 Notification and Indian Navy AA Recruitment in the below sections. Hence, the Indian Navy is inviting online before the closing date for Indian Navy AA (Aug 2019 Batch) Recruitment. The candidates who are willing to apply should have Qualified in 10+2 examination with 60% or more marks in aggregate with Maths & Physics from a recognized Board. Or has studied any one of the subjects – Chemistry/ Biology/ Computer science in 10+2. The age limit for Artificer Apprentice candidate is between 17-20 years on the day of enrolment. It means that the Date of Birth of the Candidate should be between February 01, 1999 to January 31, 2002. Qualifying in Physical Fitness Test is mandatory for selection. Advisory:- Proficiency in sports, swimming, and extra-curricular activities are desirable. The Candidate should have the Visual Standard as set by the Indian Navy. Check the standard form here. Permanent Body Tattoos – Permanent body tattoos are only permitted on inner face of forearms i.e from inside of elbow to the wrist and on the reversed side of palm/ back (dorsal) side of the hand. Permanent body tattoos on any other part of the body are not acceptable and the candidate will be barred from recruitment. Minimum Height, Weight & Chest Expansion – The Male candidate should have a minimum Height of 157 cms and proportionate weight. The Minimum chest expansion of 5 cms is mandatory. Candidates will be selected for Indian Navy AA (Aug-2019) Recruitment on the basis of the order of merit on their performance in Computer-based Examination, qualifying Physical Fitness Test (PFT) and fitness in Medical Examinations. The pay scale for the Indian Navy Artificer Apprentice post will be a stipend of Rs. 14,600/- per month during the period of Traning. After completion of Initial Training, Trainees will be placed in Level 3 of the Defence Pay Matrix (₹ 21,700- ₹69,100). In addition to the basic pay, the Officers will get MSP @ ₹ 5200/- plus ‘X’ Group Pay @ Rs 6200/- + Additional Dearness Allowance. Step 2 – Click on the link “Current Opportunity” and apply for the post which will open a new screen. There are two ways of registration (i) With Aadhaar (ii) Without Aadhaar. Candidates can use with Aadhaar option for a simplified application process. Step 3 – So, Check Indian Navy Application Form and fill with complete details. Step 4 – Also, fill the Indian Navy AA Application form with complete details and upload scanned documents. Step 5 – So, finally submit the Indian Navy Artificer Apprentice Application form and make a fee payment. Finally, here we enclose the Indian Navy Recruitment. So, contenders can make use of Indian Navy Artificer Apprentice Previous Question Papers while preparing for Indian Navy Artificer Apprentice Exam. Also, keep Searching our site Recruitment Hunt for more Government Job updates. Also, interested individuals can download Indian Navy AA Syllabus and Indian Navy Artificer Apprentice Exam Pattern 2019 here. Also, For more Job updates do subscribe to our site Recruitment Hunt.